Oh, Danny boy…the Zunes, the Zunes are calling. As a sign of the impending apocalypse—no doubt caused by the addition of the leap second—a plague has descended upon scads of Microsoft’s Zune media players. As of 2AM this morning, Zunes around the world have begun to freeze with full loading bars, resulting in completely unresponsive Zunes. Oh, the horror! 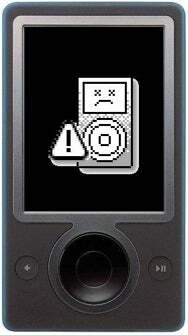 Right, so this is a weird one: we’re getting tons of reports—tons—about failing Zune 30s. Apparently, the players began freezing at about midnight last night, becoming totally unresponsive and practically useless. Wow, that’s a lot of—wait, tons? There are tons of Zunes out there? Besides the tons that have been dumped in the giant landfills just outside of the Redmond campus? The glitch, dubbed “Z2K9” seems to mainly afflict 30GB Zunes, and has spawned threads all along the watchtower Zune fan sites. Above all, it’s raised one major question in my mind—to wit: there are Zune fan sites? But I kid, I kid! If there is any karmic justice in this world, then all of my iPods will likely go drive off a cliff later today. Dare I ask if there are any Zune users out there who’ve been experiencing this horrendous event?